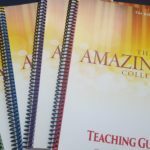 The Amazing Collection Bible study is grouped into eleven sets from The Pentateuch to New Testament Letters and Revelation, and is designed for each set to cover one 5-9 week class. Taken together, these eleven separate studies cover the entire Bible. 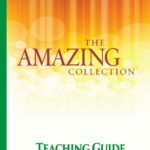 Each Teaching Guide contains complete lesson plans in an easy to teach format, and is used along with the companion workbooks. As part of the study, download our free Leader Resources to supplement your teaching, including class guides, games and reviews, and other class materials.